Bringing you the food you love because we're patriots. Posted 7/4/2014 8:33am by Elaine L. Lemmon. Today you celebrate your right to access the food YOU want in your body: nutritious, lovingly produced in a manner that protects our environment, and cultivated by a face you recognize. Today represents different meanings to millions of Americans but it comes down to one concept we all hold dear: our right to take care of ourselves and our loved ones. Everblossom Farm IS my independence; I can feed myself, I can sustain myself financially, and I can teach others how to grow quality food while giving back to the soil. Granted, it isn't easy work, but who said that independence is easy to achieve? In our personal struggle to "liberate" ourselves from dependency, we have to toil to achieve even the smallest step. I take pride in my independence and my ability to provide for myself and others using growing practices that don't jeopardize our beautiful land. You, as loyal customers, should take pride in sustaining my business to continue this work. Thank you for using your food rights to choose Everblossom produce. ok-enough of the heavy stuff! It is an exciting time at the farm-I know that I say this year in and out, but the miracle of growing food will never grow old! Raspberries are coming in, expect them in your CSA bags soon. We just tucked the last of our sweet potatoes into the soil, and the winter squash has germinated, looking very healthy. We completed the tomato trellis and it looks like we have a month and some change before we will be harvesting 'maters. So mid-August harvest date. In other tomato related news, we will hold a canning special in the fall. If you like to can your own sauce, slices, or make salsa, then check with me in September about canning 'maters. I'd like to insert a humble brag here (kid's terms these days): our beneficial insect population is thriving! This is INCREDIBLY important to uphold our mission of Integrated Pest Management (IPM), which greatly reduces the need for hands on pest control and organic insecticides. I recommend learning about PA's native beneficial insect population so 1) you can encourage a healthy population in your neighborhood and 2) you don't swat the Good Guy. Next in our Humble Brag news-our weed control is On Point. We all know that weeds are the manifestation of the plague in gardens. You ignore it one day too long and the whole garden has fallen to its evils. Well not this year. We liberated our garden from the oppression of weeds because we are patriots. Enjoy this beautiful day, and always Exercise your Right to eat Responsibly. Posted 5/21/2014 10:50pm by Elaine L. Lemmon. We're excited to begin a new season! Here's what you'll find in your CSA Base shares (small) this week. Custom shares are larger and include several more great spring veggies. Posted 5/15/2014 4:40pm by Elaine L. Lemmon. The CSA starts next week! Don't miss out on any of our delicious organic veggies! We just spent the day planting like maniacs in preparation for this supposed big rain coming our way. I've been watching the radar like a woman obsessed. Bring it! We have so many delicious crops in the ground that are ready for a good spring drink... kale, collards, onions, potatoes, carrots, beets, salad mix, lettuce, spinach, radish, potatoes, salad turnips, peas and more! It's going to be a great season. Join us. Posted 4/13/2014 6:00pm by Elaine L. Lemmon. We're delivering all over the place! From Harrisburg to Baltimore, we're bringing our great goods to you. If you have already signed on for our CSA, a heartfelt thank you and hug to you. If you're still debating, look no farther - call me if you have questions. Our staff this year is stellar. For example, they arrived in early March from Hawaii and were greeted with negative degree PA wind chill. Their reaction? "Wow, that feels fresh." They hit the ground running right beside me. We're excited, exhausted, and energized all at once. We're ready for an excellent season. Already there are many crops planted outdoors and thousands of seedlings in flats just waiting for their day in the sun. Don't miss out on our premium produce. Sign up for the CSA today! Customize it - size it - pick your location - make it just right for you. Our farm is innovative, progressive, and resource conservative. Choose us and you'll be investing in a farm that protects our community's land, air, and water for decades to come. Posted 2/7/2014 11:51am by Elaine L. Lemmon. Don't miss out on our Valentine's Special! Get $50 off your Deluxe Customizable Share. Give your sweetheart the gift of fresh, delicious food and good health. Coupon code LOVE2014. Now you can save on a Classic Customizable Share also! Feed your family of 2 (veggie enthusiasts) or 4 (average produce eaters) the best organic produce in the region. Best of all, you can choose what is in your share every week. Buy your Classic share online before the end of February and save $20. Coupon code BESTCSA. Our first CSA member appreciation party is on the calendar!!! Sign up now and get an invite to this exclusive event. Cocktails in the new greenhouse, dinner in the barn, and an evening bonfire. Sign Up Now for Our 2014 CSA... We Never Stop Growing. Posted 1/15/2014 9:41pm by Elaine L. Lemmon. !! !Buy a Share you can Customize Each Week!!! We have a few options to choose from this year. Most exciting is the customization that we're offering. I've heard from folks for years that they'd like to select a few items for their weekly share. And now you can! If you don't have time in a busy week to log in to select your favorites, we'll chose the most popular for you so you don't miss out on the incredibly fresh and delicious produce we grow. We grow food all year long so you can have fresh produce without fail, every month of the year! Click here to find out our Summer CSA options for extending your CSA share. These shares are great for single folks or as an addition to a regular CSA share. Get $50 off when you sign up for a Deluxe Customizable Share for your sweetie before February 14th! Are you interested in becoming a drop off site host? Hooray! Contact us to find out how you can earn big discounts or even a free share! Check out our job description and see if you have what it takes to be a part of our great team. Posted 1/3/2014 10:40am by Elaine L. Lemmon. 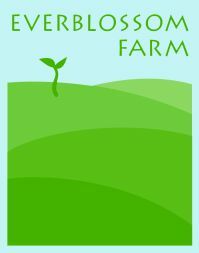 Everblossom Farm, a certified organic vegetable farm in south central Pennsylvania, is seeking applicants for seasonal employment during the 2014 growing season. The time frame is roughly March through November, and a commitment to the full growing season is required. Specific start and end dates are negotiable and will be outlined in a written employment agreement for each employee. Seasonal employees who demonstrate outstanding performance will be eligible for winter seasonal positions, longer term employment, and increase in compensation. Seasonal employees will work with the farmer/owner and assistant manager to carryout all farm functions. Under the direction of the assistant manager, seasonal employees will perform seeding, transplanting, weeding, irrigation, harvest and packing of produce. They will contribute to marketing and deliveries of produce via farmers’ markets, Community Supported Agriculture (CSA), and wholesale accounts. They will take part in general maintenance of farm infrastructure such as cleaning, basic repairs, and painting. They will operate small engine equipment such as mowers, trimmers, and a walk behind tractor. They will assist with livestock management, such as feeding, cleaning, caring for, rotating, and processing pastured poultry on an as-needed basis. Everblossom Farm is located on a 190-acre family farmstead in Adams County, PA. Every season we explore new ways to diversify our farm and meet local demand for fresh, organic products. 2014 will be our eleventh season in sustainable vegetable production (our eigth season managing staff), and we have been Certified Organic since 2011. The farm is transitioning from a three-generation operation producing hay, straw, grain and beef cattle to organic and sustainable practices. The current operation includes 15 acres of organic vegetable production for a 170-member summer CSA, an 80-member winter CSA, and sales at a farmers' market, health food stores, and restaurants. Products include organic seasonal vegetables and berries, and winter vegetables grown in our passive solar greenhouses. Starting compensation for seasonal employees includes an hourly wage for 40 hours per week, plus fresh produce and modern shared housing on site. There is the opportunity to earn more through longer hours during peak season and independent farmers' market attendance. Farm work experience is preferred, and the wage is negotiable based on experience. Applicants of all levels of experience are encouraged to apply. For a complete job description and application procedures, please visit the Job Opportunites page under Experience Our Farm. Posted 9/26/2013 1:00pm by Elaine L. Lemmon. We're so excited to be having an autumn harvest party, and we hope you can join us at the farm to celebrate the season on Saturday, October 19th from 12:30 to 4pm. We'd be delighted to welcome your family and friends also. This will be a potluck style picnic. We'll provide hamburgers using beef raised right here on the farm, as well as all types of beverages. Please bring your favorite side dish or dessert to share as well as your own place setting. If weather permits, we will set up some yard games and you'll be welcome to find a cozy spot anywhere on the farm to relax on your own blanket or chairs. In the event of rain, we will be ready to keep you in party spirits in the renovated barn where Eric and I were married last October. Rain or shine, we will have a good ol' community gathering on the farm! I will be giving a farm tour from 2 to 3pm so you can all see where we've been lovingly producing your veggies, and to highlight some cool new projects like our pastured turkeys (we're taking orders now for Thanksgiving!) and the next passive solar 4-season greenhouse for our Winter CSA produce. I'll also talk a bit about our goals for furthering the sustainability of Everblossom Farm. My staff and I are really looking forward to having some fun down time with you all. You'll also meet the newest member of the farm - my daughter, Harper. I'd be delighted to hear from you if you can attend! Posted 4/22/2013 8:53am by Elaine L. Lemmon. This blog's author is Megan, our new crew manager. She's had a small staff to oversee so far, but their tasks have been diverse and extensive. While this was written several weeks ago (thank you, Megan), we do still struggle on these frosty mornings with the dilemna of "long underwear today? Or no?" Spring has arrived! Farmers rejoice! It’s time to get to work. There’s hoeing and digging, transplanting and weeding to be done! I can finally put away my long underwe- snow?! Oh well, I guess I’ll have to layer up for another few weeks. Despite the clinging chill in the air, here at Everblossom Farm we have been staying very busy during these last few winter months. This is the last week of our Winter CSA and I know we have been enjoying our harvest here at the farmhouse. We have been eating kale at least three times a day, throwing it in everything from tuna salad to sloppy joe’s! We hope you were able to come up with some new recipes this winter as well. Ellie Mack and I have been seeding like crazy. We’ve got onions, leek, collards, celery, celeriac, kohlrabi, kale, cabbage, bok choi and much more to come. In addition to seeding, we have been “pricking out”, a technique that is new to me. I will attempt to explain. When the seedlings are a couple of weeks old, we transplant them to a second tray or “flat”. This gives them more room to grow, since they are seeded very closely together in the first flat. The process requires one to pull the seedlings out of the dirt, trying not to disturb the fragile roots. I was nervous at first, thinking that I was certainly going to harm these tiny plants during the journey from first to second flat. Elaine assured me that the cute little buggers would be fine. With the appropriate handling, they are no worse for the wear. I’m happy to say that Ellie and I have become quite adept at pricking out. We have had plenty of practice already, some days going for 5-6 hours! These last few weeks of winter are a good time to prepare for the upcoming season. We have been doing a lot of cleanup, both inside and out in the fields. The barn was home to a mountain of bean pods so large that Ellie and I were prompted to dub ourselves the “queens of beans”. We even climbed to the top and snapped a picture of us conquering Bean Mountain before hauling truckloads out to compost. We are working on the bigger and better washroom, which is very exciting. The new space is going to give us a lot more room to process our delicious vegetables. Cleaning up the fields is very important around this time of year as well. We pulled all of the old peppers, kale, brussel sprouts, basil and bean plants in order to make way for this season’s plants. We even managed to salvage some brussel sprouts for us to eat. All of these dead plants are added to the compost pile, which will be used next year. The tomato and asparagus plants require a bit more work. Tomato plants are pulled out of the ground and piled with the asparagus plants, which are cut down to ground level with a scythe. These piles are then set ablaze with the backpack FLAME THROWER! Pulling, cutting and piling all those tomato and asparagus plants took us a lot longer than the three minutes it took for them to burn. Nevertheless, I have to admit this job was actually fun. Wielding the flame thrower makes one feel like a superhero of sorts. It could be all that kale I’ve been eating too, though. As you can see, the farm team is working hard and preparing for a great season. We hope you are just as excited as we are! Posted 3/20/2013 9:24am by Elaine L. Lemmon. My friend and gracious host at ACTV, Mark Berg, invited my colleague, Elizabeth Weller, and me to talk about why CSAs are good for our community and how they work. It was a lot of fun to do this and I'm honored to have had the opportunity to promote my farm and help educate consumers about local food.